There was an insert in the Sunday paper today with 3 double coupons for Albertson's. This time they are only good until Tuesday so try to get in there soon! Last weekend I took my double coupons to the Albertson's in Redmond. I am continually amazed by the deals I find at that Albertson's in particular. I took a picture of my non-food purchases last weekend and most of it was from Albertson's. The 7th Generation diapers were regularly priced at $11.99 but were on clearance for $5.49! I also had a $1.00 off a 7th Gen product that doubled so I ended up getting this package of diapers for $3.49. Several of my friends use this product so I was super excited to get a potential shower gift for such a great price. Too bad DH opened the package looking for a diaper yesterday - sorry, size 1 won't fit our 22 pound baby. Rats! So, being resourceful, I'll just save them for baby #4. The Purex laundry detergent was also on the clearance rack. It was regularly priced at $7.99 but was marked down to $2.99. I had a buy 1/get 1 coupon so I got these jugs for only $1.49 and $1.50! I was almost out of dishwasher detergent and really concerned I would have to pay full price. Not so! This Cascade was regularly priced at $5.99 but on sale for $3.99. I had a $1.00 off coupon that doubled so this bottle cost me $1.99. 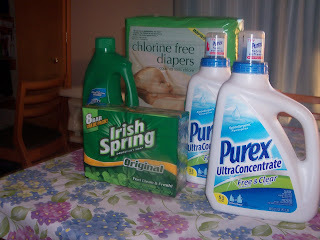 I bought the Irish Spring at Safeway for $2.99 with one of their weekly coupons. I got to the $10 requirement to use coupons by also purchasing a four lb. bag of frozen chicken breast for $6.76 and some bananas. I am so super excited to have chicken again, even though it is a small amount. I am rationing myself!